It is no secret that Donald Trump and the mainstream media do not get along, in fact that is quite the understatement to say the least as is evidenced by the press conference the President-elect held last week. There has been speculation that because of this Donald Trump would cancel press briefings or possibly just kick the White House press pool out of the White House but if this report is true he might actually be doing to opposite. This might be Donald Trump’s way of getting back at the mainstream media but I have to think if more people are involved in the briefings it cannot be a bad thing. The left will accuse him of favoring outlets which view him more favorably but they should remember that Barack Obama did the same thing when he pre-selected which reporters he would allow to ask him questions at his press conferences. 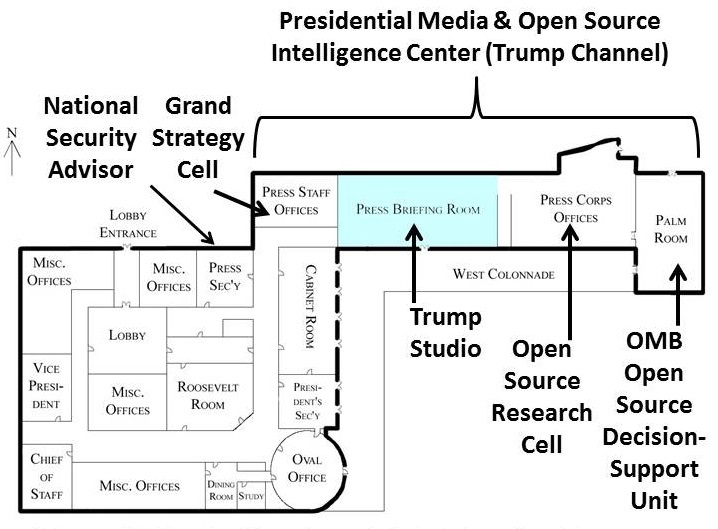 One reason to move the press is to use the space for Trump’s own media center. Here is one proposal. Giving “transparence” back its meaning. That’s a good thing. Evil always likes to confuse, distort, mis-represent the truth; makes for bad business and puffed up ego-maniacs! – worthless parasites! An Aunt in Canada made a snide remark about Trump getting in, so I told her the scoop: how the propaganda media lies to cover the corrupt; and not to listen to what the anti-American news tells her! They have a liberal (twist of a good word) perspective being run thru their veins there, so she probably thought ‘queen of darkness’ was light and good! Wrong. She’d be prosecuting Alt media (you and other bloggers) off the internet air waves! It is quite a change after the last eight years when the alt media has been ridiculed! There was talk the Obama regime was going to go after the bloggers and I think Hillary would have as well, but now it appears as if the tide is turning. OT: but entertaining! Click on ‘sound’ volume and turn it on when window opens. That pretty much sums it up although I don’t think they pray–at least not to the one true God! Agree. She probably did some blood sacrifices to the ‘god of this world’ though, but I think God answered the prayer of many believers who requested she not be ‘allowed’ to ‘steal the election’ and get in – period! 2 Cor 4:4 (KJB) In whom the god of this world hath blinded the minds of them which believe not, lest the light of the glorious gospel of Christ, who is the image of God, should shine unto them. OT ~ Steve could you plz email me your land address – have something for you! Thanks! haha ~ Happy Patience is a Virtue!